There was packed a lot of character dining into the second half of the trip. I even managed to sneak TWO breakfast reservations into our plans. While the kids and I love breakfast food it’s not Grumpy’s favorite meal of the day. Usually, I only get one, but this year I was set on checking out Cape May. I mean, it was right at our resort. How could I skip it? Diva wanted the whole family at “my princess breakfast” AKA Bon Voyage Breakfast with Ariel and Rapunzel as well as their respective princes. We also had a big debate on which of our top two favorite meals to return to: Hollywood & Vine or Tusker House. It was a really hard decision for us. Hollywood & Vine has always been really fun and filling. Tusker House character blow us away at each visit, but their food was a hit our first visit but a miss on the second. The dessert buffet at Hollywood & Vine tipped the scales for which of the two we would return to this year. The seasonal costumes of the characters also weighed in a bit. Our breakfast was scheduled “late” on our break day. We really had nothing particular to do all morning yet breakfast was pretty rushed. Grumpy hadn’t been feeling well when we walked over, but the kids convinced him to come along. We managed to get a minute with Daisy before the morning got a little rough. As soon as the first plate of food was on the table Grumpy knocked over a full glass of orange juice. Minnie showed up as we were in the midst of cleaning up the mess and I very embarrassingly called her Mickey. The kids wanted their picture and at least I had managed to dry off my phone so I snapped it really quickly before returning to cleaning the table. It was at that time that I picked up a napkin we dropped on the floor and say Minnie’s high heels. I was ready to crawl under the table by then. Peanut had piled up his plate with a ton of food and luckily it was spared from the spill. Diva needed some more food and she wanted to check out the omelet station. There were two cast members near the entrance of the restaurant preparing custom orders. Diva had spied them as soon as walked in and knew she wanted one. The cast members showed her step by step what they were doing and told her to prepare for the “flip.” She loved watching them flip without a spatula– something that will never happen in my house. Finally, we were ready to eat. Grumpy was done with his fruit by the time we returned to the table. There was a slight lull in the characters so I had time to eat a bit of my food. Diva picked at her breakfast and once Grumpy decided he wanted to head back to the room for a short rest she wanted to go with him. I had barely eaten and needed more Mickey waffles! Peanut wasn’t ready to go either. He wasn’t eating quite as much as his eyes had told him to load up onto the plate. Donald and Goofy came around to visit. Goofy and Peanut talked about sandcastles and who might build a bigger one. Peanut chatted about the ones he had been building throughout the week just outside at Stormalong Bay. And with that I had finished off another plate of Mickey waffles, half our family was missing, and we met all the characters. It was probably our shortest character meal ever– just about 45 minutes. I want to go back another time with less chaos and more time to enjoy it. Per Diva’s request, our meal was a family affair this trip. (The first visit was just the two of us while the boys slept in.) I was very sad to see the frying pan arch was no longer done at the opening of the restaurant. Outside of that, there wasn’t any change to the food or festivities. Our meal was a bit of a disaster though. First Diva chugged through a cup of chocolate milk. She asked to go to the bathroom and promptly threw most of it up. I was ready to leave the meal so we could scrap our plans and rest, but she insisted she was fine and showed no other signs that anything was wrong. It was when we got back to the table that I realized the milk was gone and she had certainly gulped it way too quickly. Next, it was my turn to make a spill– my full glass of milk. Luckily most of it ended up on the floor and I jumped out of the way pretty quick. Some of the food was ruined but the staff was super nice and helpful to replace it. We were feeling quite embarrassed at this point and thankful to be sitting in the corner. We did manage to have a fun time with the characters. And Diva was happy to join Ariel parading through the restaurant. She even tried to encourage her brother to join her but he had no interest. We were excited for our third visit to Hollywood & Vine in as many trips. Our day had been rather relaxing. 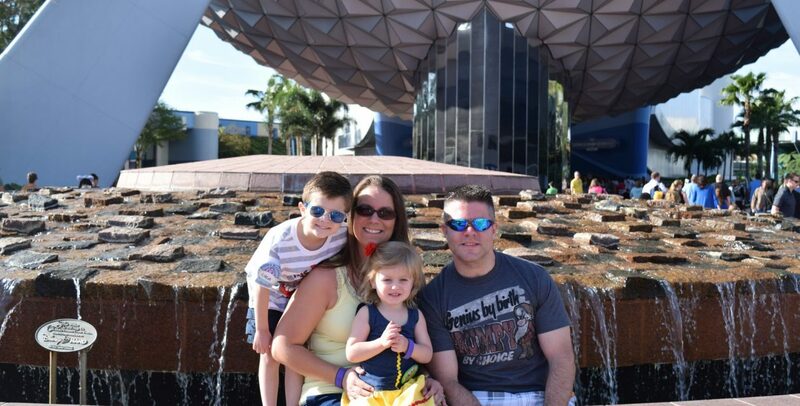 We enjoyed the morning at Epcot, a bit of time at the pool, and visited Toy Story Land before our reservation time. We checked in and had a short wait to be seated. It was an awkward seat near a couple of large pillars and the main entrance. It left little room for pictures and the characters really blocked the aisle for anyone that was trying to walk. It was inconvenient but we always make due unless there is an actual problem with the table. When we sat down Grumpy was checking his phone when Goofy arrived and he was scolded a little bit. I wish I had my phone in my hands to capture the initial picture while Goofy was lingering over Grumpy’s shoulder but the scolding was just as a good! The food was Disney standard buffet options. I really enjoyed the carved beef! The carving stations at the buffets are almost always a hit with our family. The kids also love unlimited chicken tenders, fries, and mac and cheese. Since the main buffet was the norm I was a little surprised when I went up to the dessert buffet and found many more seasonal selections. Lots of pumpkin options. But we don’t love pumpkin. Many of the standards hadn’t been refreshed and were disappointingly slim in options. We each did found a few things for our plate and, of course, a bowl of the soft serve ice cream!! A short time passed to eat our first set of dessert and say hi to Mickey. The second pass wasn’t much better than the first so we loaded up on the options we had enjoyed. I watched to check for someone refreshing the stations but surprisingly no replenishments were making their way out. One more dessert for each of us and we called it the end of the meal. I left slightly disappointed since the dessert expectations had been so high based on our prior visits. The characters did provide their usual amazing entertainment and their costumes were fantastic! Peanut and Diva both thought Donald’s space suit was the best. I’m torn as to whether or not we would return at Halloween again or wait for another season to see what’s offered. Still even more to come!